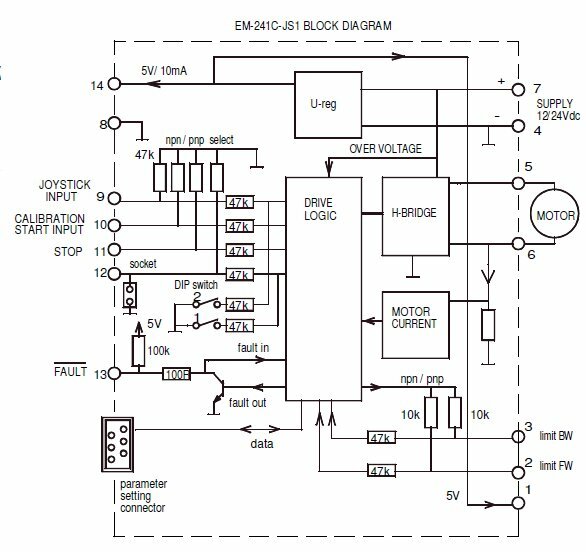 EM-241C-JS1 is a full bridge DC-motor starter. It is designed to joystick controlled DC-motor applications. Drievr has adjustable acceleration and deceleration ramps, which make possible the smooth starts and stops. Adjustable current limit protects motor against overcurrent and it can also be used as an end-stop. This device has also two settable speeds, separate speed ranges for forward and reverse direction. Control input is specially designed for joystick control. The joystick range calibration is done automatically, when calibration function is activated. Calibration detects forward, reverse and midpoint positions. FAULT terminal has at the same time input and output function, the pin is normally high, but is pulled down in overheat and conditionally also in current trip situation. If FAULT-line is pulled down externally it will cause a stop and prevent the new start. For example, it is possible to link fault pins of several units together and achieve a syncronous stop. There is also special settings as start-kick which could be used if there is danger of stuck. Limit input can be individually set for NPN or PNP logic. The parameters settings can be done with various EM- interface units. Operation of the controller and some of its functional values can also be monitored with interface units.